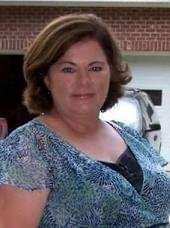 Betty Zepeda 57 of 4016 Andrews Chapel Road died Thursday March 21, 2019 at her home. Betty was born in 1961 to the late Calvin and Hetty Ramsey Jefferson and worked for Barnhill Contracting Company as a Truck Driver. She was also preceded in death by a grandchild Zechari Ojeda and a brother John Jefferson. The family will receive friends Saturday evening March 23, 2019 6:00pm until 9:00pm at the home 4016 Andrews Chapel Road Roseboro. Betty leaves to cherish her memories Daughter, Sherry Gloshen (Husband Nick) of Roseboro, Son Jason Ojeda (Wife Elizabeth) of Wilson, Brothers Gary Jefferson of Salem VA, Roy Jefferson of Red Oak NC, Sisters Della Hogston of Salem VA. and Sheila Jefferson of Roseboro 9 Grandchildren. Services entrusted to Hope Valley Hawkins Funeral Service & Cremation 1246 Hobbton Hwy Clinton.